A fantastic opportunity has arisen to purchase Glebe Holme, a stunning, three bedroom detached bungalow which has been recently finished to exacting standards and has been beautifully and lovingly refurbished from top to bottom incorporating a new extension and finished with high quality modern fixtures and fittings throughout. The comfortable modern living designed accommodation briefly comprises of a newly extended large kitchen/diner with bi-folding doors leading out to an excellent outside sunny patio area for evening entertaining, utility, cloak room, lounge, three double bedrooms, one with en-suite and a family wet room. 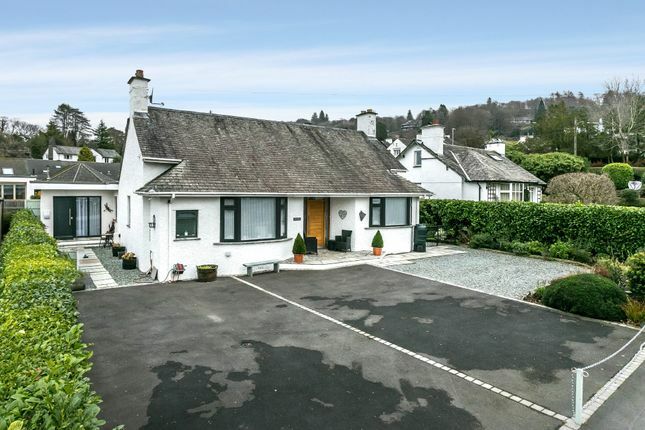 Situated in the heart of the village of Bowness-on-Windermere this property is quietly tucked away on Glebe Road but positioned just a few minutes walk from the Lake shore, and many local walks. There are a large range of local amenities and tourist attractions close at hand, transport links including train, bus and Lake Cruisers are all within easy walking distance and offer excellent accessibility to enjoy the beautiful Lake District National Park. Glebe Holme offers a superb opportunity to purchase an immaculately presented property, ready to move in to and will appeal to a wide range of buyers either as a permanent family home, holiday retreat or holiday let investment. Directions From our Windermere office in Ellerthwaite Square proceed down New/Lake Road through Bowness village and the shops passing the Lake shore and ferry piers. Continue up the hill on the A592 and take the next right turn onto Glebe Road with Glebe Holme being the second property on the right hand side with driveway. Accommodation Through the modern oak front door with glass side panels into a spacious hallway. Main Hallway A large hallway with loft access to a fully boarded loft with lights, radiator and a loft ladder. 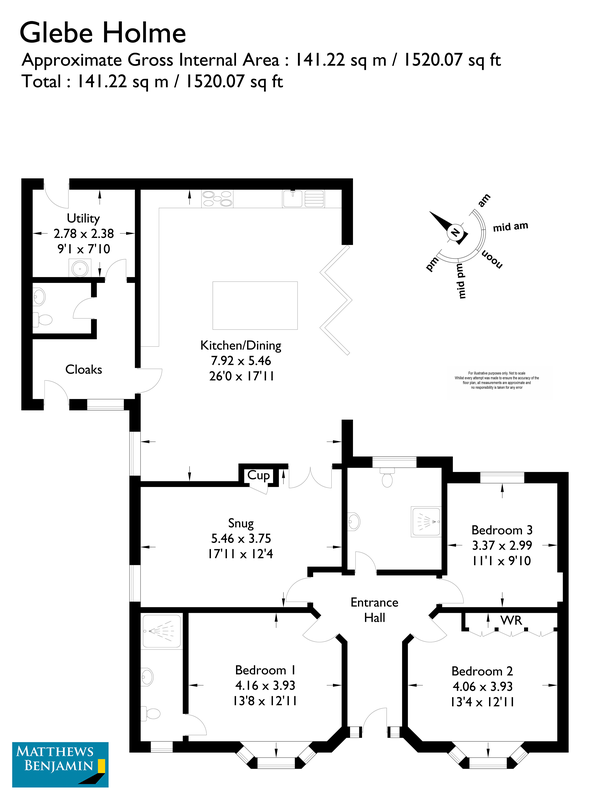 Kitchen/Dining/Day Room 26'0 x 17'11 (7.92m x 5.46m) The main reception room is the large open plan kitchen/diner which provides the ideal family space, which is the heart of the home, with a top of the range, stylish kitchen with an island designed by Webbs of Kendal in stylish, high gloss grey and white units with complimenting Silestone work tops. The kitchen is well equipped with an extensive range of all the latest integrated Neff appliances, including a dishwasher, two ovens, microwave, wine cooler and an induction hob. There is ample space for a dining table and seating area, the room has modern flooring with under floor heating. Large bi-folding doors flood the room with natural light and open out into the garden. TV Point. A glass oak door leads through to an inner hallway. Inner Hallway With a spacious area perfect for hanging coats and storing muddy boots with an external door. This area gives access to a cloak room with WC, hand basin and utility room. Utility room 9'1 x 7'10 (2.78m x 2.38m) A spacious utility area with plumbing for washer & dryer and shelving for storage. There is a sink and an external door leading to the rear of the property, the hot water system and Valiant boiler is located in the area. Bedroom One 13'8 X 12'11 (4.16 mx 3.93m) A large double bedroom with a bay window over looking the front of the property, with privacy blinds. The bedroom has a thermostatic radiator and TV point and a modern oak door. En-suite wet room with a dual head shower, WC, sink unit with draws and fitted mirror with light above. Fully tiled with contemporary tiling and a decorative boarder. Bedroom Two 13'4 x 12'11 (4.06m x 3.93m) A large double room with a bay window positioned at the front of the property, with privacy blinds. Large fitted wardrobes, which also contain shelving to create lots of storage. The room also has a thermostatic radiator, coving and a modern oak door and TV point. Bedroom Three 11'1 x 9'10 (3.37m x 2.99m) Double bedroom overlooking the rear of the property. The room also benefits from a thermostatic radiator, coving, TV point and an oak door. Bathroom A stylish and modern wet room with a walk through shower unit with dual shower heads with glass screen, WC and sink with a light up, clear mirror over. A wall mounted shaving plug point and compact hairdryer unit is conveniently located next to the sink unit. There are two contemporary heated towel rails, and the room is fully tiled in natural coloured tiles, with a co-ordinating feature tiled wall. Outside At the rear of the property there is a beautiful paved seating area and a small lawn with an excellent sunny aspect ideal for outside summer entertaining. The front and the side of the property has a simple laurel hedge for added privacy and a mix of various shrubbed boarders and gravel paths. One of the big advantages of this substantial property is the parking amenity for several vehicles which is extremely rare for a property of this nature so close to the centre of the village. Please Note: The vendor of the property is a employee of Matthews Benjamin Estate Agents.